I'm back, how is everybody? Enjoying some creative time I hope and getting lots of cool ideas gathered up to try on a rainy day. I have several in mind myself for the next cloudy day. Now as for today I thought that I'd continue on with my Pirates Cheer Mini Series. 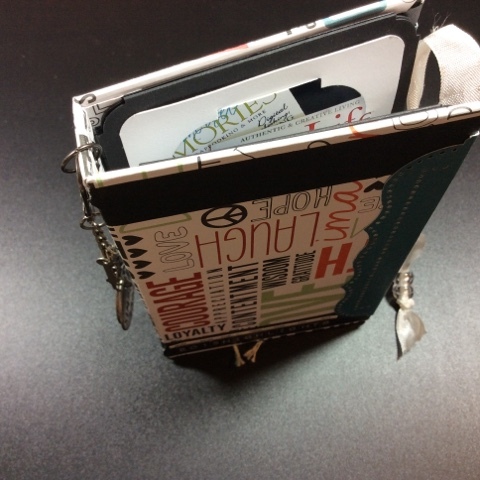 Today we are on style number 6 with my mini books. This mini I am calling a ribbon bound mini because quite obviously it is bound using orange ribbon. As for the covers and pages they are just as I have done for all the other minis. The covers are made using a medium weight chipboard then covered with a black & white pattern paper and the pages are done with a white card stock. There are 6 pages in total which I have kept standard in all of the mini books I made for this collection. The biggest difference with this mini is the orientation of the pages, so far most of the minis cater to a 'portrait' style of photograph but in this mini I designed it so they'd have a 'landscape' style of photograph. When coming up with mini books that would offer a wide variety this was one of the first to come to mind. In fact this is the first type of mini scrapbook that I ever learned how to make completely from scratch...that was about 8 or 9 years ago...just to give you an idea. Now when deciding what to do with the pages, again I had to keep them super simple because I didn't want to overwhelm anyone plus I knew that I had to duplicate it several more times and the harder the first one is the harder the ones to follow are. So most of the pages are blank leaving tons of room for thoughts and/or stories, a couple of them have a photo tuck at the end of the page to help keep photos or ephemera in place and then the front page has a little bitty pocket that is absolutely adorable so what the heck. The back, because of the ribbon, has a simple elegance to it and really finishes off the whole piece. Now as for stuffin' this mini it is not meant for a ton of 'stuff' due to the nature of it's bindings, unless of course that 'stuff' is flat - but it is however geared for the soul searcher, the writer, the poet, possibly even a pen artist and then maybe a few photos of some favorite things to add some visual interest and/or color...least that's kinda my vision for it. So there you have it, number six in this style which I made ten of. Crazy huh? Yeah tell me about it but I enjoyed making them even if it was a ton of work. If you have any questions you know what to do. Thanks!! !